This book is a comprehensive contributed volume that aims to describe and explain the design, fabrication, operating characteristics, and specific applications of the most popular and useful types of specialty optical fibers. These “specialty fibers” include any kind of optical fiber that has been architecturally manipulated to diverge from a conventional structure. For instance, metal-coated fibers can be utilized for bandwidth improvement, and hollow core fibers offer more controllable dispersion for sensitive medical procedures. Applications for these specialty fibers abound in the biomedical, sensors, and industrial fields, as well as in more traditional communications capacities. 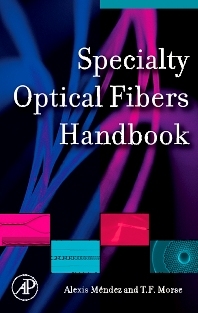 This book will act as a specialty fiber “guided tour,” hosted by the top names in the discipline. The globally renowned editors, Drs. Mendez and Morse, have extensive experience in research, academia, and industry.